Whether you would rather be a demure southern belle or a disco diva, vintage costumes can be a fun option for Halloween Costumes, a masquerade, or any other occasion. In many cases, vintage costumes are actually articles of clothing from a former era that have survived to the present time. However, the term "vintage costumes" is also used to refer to modern costumes that are made in the style of fashions of the past. While there were diverse fashions in every era, the following ideas represent the iconic style images of these time periods, for the most common and recognizable vintage costumes. When women choose to emulate the styles of the 1800s, they typically choose the most elaborate hoop-skirted dresses, channeling Scarlett O'Hara and other southern belles. Don't forget a wide-brimmed hat and parasol to complete the look. A Civil War uniform is one option for men wishing to accompany the fancy dress costume of a nineteenth-century lady. 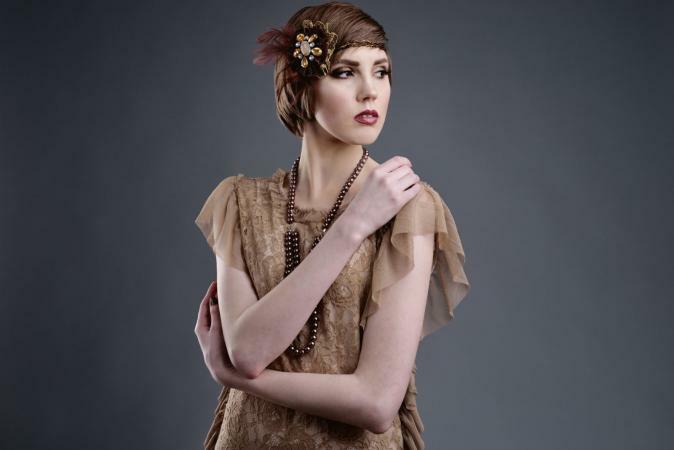 The 1920s was the decade of the flapper. This free-spirited time saw hemlines rise and waistlines disappear. Women often wore cloche (bell-shaped) hats. Men wore suits, commonly in the wide-breasted, pin-striped style associated with movie gangsters. The fedora was a popular hat for men. Women looking for glamor can mirror the long, satiny dresses of the era's starlets. World War II-era costumes can mean uniforms for men, khaki skirts and blouses for women, or a recreation of the Rosie the Riveter look. The fashions of the 1950s have been immortalized in movies and television. When you think of '50s costumes, you most likely think of poodle skirts, letterman sweaters, and leather jackets for the "guys from the wrong side of the tracks." Another popular costume choice is the 1950s-era prom dress, typically a strapless gown made of a light, frothy material with a full skirt. Vintage costumes from the 1960s vary greatly depending on the specific year. Clothing from the early '60s is similar to clothing from the 1950s. Women wore tailored dresses or skirt and sweater sets and idolized the look of Jackie Kennedy. Men wore suits and cardigan sweaters for a very Ward Cleaver-ish look. In terms of popular costumes, the later years of the decade belonged to flower children and mod fashion. While hippies wore long, flowing dresses or bell bottoms, open-necked shirts, and vests, others turned to mini skirts, go-go dresses, and boots. Fashionable men wore paisley shirts and grew their hair long. While the early '70s mirrored the styles of the late '60s, the latter part of the decade definitely belonged to disco. Polyester was the fabric of the day, and leisure suits weren't yet considered a questionable fashion choice. Women wore loose dresses suitable for dancing the night away. Turn to the following sources for vintage clothing and costumes. You never know what may be lurking in the closets of friends and family members. If you'd like a costume from a particular era, ask someone who lived through the time period. There may be some authentic bell bottoms or an old-fashioned prom dress lurking in the depths of a storage chest. The discarded clothes of others can be prime vintage costume pieces. However, you have to be willing to search the racks at thrift shops and dig through piles of clothes at garage sales. There are also resale shops dedicated to selling vintage clothing. Some people look to vintage clothing stores for Halloween costumes, some enjoy the kitsch of wearing something from a bygone era, and others are fashion-forward trendsetters waiting for the next big thing in recycled styles. Costumes will be more expensive at these shops because they understand the history and marketability of the items they carry. Costume shops offering costume rentals often stock vintage costumes, complete with accessories. This can be a more economical way to enjoy an authentic costume for a single night. Klassic Line Vintage Clothing & Costume offers clothing, jewelry, and accessories from every era, and also sells patterns for those interested in making their own vintage looks. eBay features numerous auctions for vintage items. Bonnie's Treasures offers vintage clothing and costumes for men and women. The Costumer's Manifesto offers resources on finding, creating, and taking care of vintage costumes. The Costume Gallery presents 45,000 images from the nineteenth and early twentieth centuries to aid in costume research. Fashion-era.com provides information on vintage clothing, with a focus on collecting and selling vintage looks.